Strolling through the Bonnyrigg shopping centre, I see a saffron clad monk walking in front of me. To say he stands out from the throng of suburban shoppers is somewhat of an understatement, but its been a while since I have been surprised to see the monks mingling with the suburban hordes here. Located a stones throw away from this centre of consumerism, the three impressive Chinese, Cambodian and Lao temples at Bonnyrigg are superb examples of classic Buddhist architecture. They are a testimony to the local communities who have devoted their time and energy to construct these wonderful temples which are deserving of a visit. The Chinese Mingyue Lay temple and its surrounding garden is one of the largest in the Southern hemisphere. Opened in 1990, it's a massive building of some 16 000 square metres. The temple is of a classical 12th century Chinese design and is a fine example of Buddhist Mahayana tradition. The main shrine houses some 37 bronzed Buddhas from Thailand and celebrates Buddhism, Taoism and Zen. On Chinese New Year, the temple grounds are swamped by thousands of people who descend to worship, give offerings, eat at the many food stalls and celebrate the New Year. Visitors are welcome and the temple is open between 9.00 am-5.00 pm daily. Completed in 1998, the Cambodian Temple Khemarangsaram temple is typical of traditional Khmer Buddhist architecture. Set high on a hill, it is an incongruous sight surrounded by the Bonnyrigg shopping centre car park and a Bunnings store. Entering the temple, you are met with the sight of a large bronzed image of Buddha, surrounded by smaller images, flowers and candles. The temple's interior is decorated with pictures and paintings of the Buddha, monks and nuns. Currently there are eight monks who are in charge of the various religious activities held at the temple. Celebrations held at the temple are the Pchom-Benh Festival and Cambodian New Year. The first – a remembrance for those who have passed way - is held every year from September 29 to October 1. The Cambodian New Year is usually celebrated in mid April. The temple can be visited between 7.00 am to 6.00 pm. 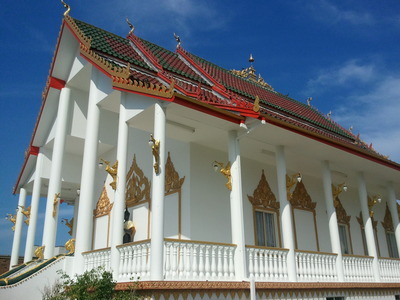 This beautiful traditional Lao temple was completed and consecrated in 1993. Its design is based on the Golden City temple in Laos, one of the countries most significant and important Buddhist structures. 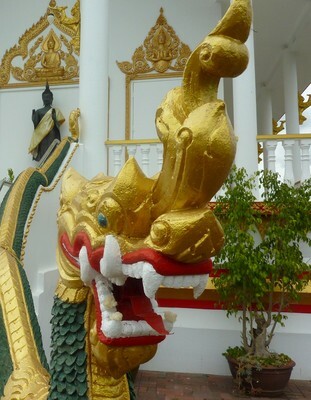 The curved roof and staircases are decorated with golden dragons who protect it from evil. The temple houses a large three metre high golden Buddha weighing some 800 kilograms. The temple currently has four monks in-residence and six visiting from Thailand. The next event to be held here is the Boon Bhodi tree ceremony on Sunday the 4th December commencing at 10.00am. Address: 711-715 Smithfield Road Bonnyrigg. Visitors are welcome but they should be appropriately attired. Take your shoes off when you enter the temple. Inside you must kneel with your feet pointing away from the images of Buddha. Buddha images are sacred objects, so do not pose in front of them for pictures and do not stand on the altar. The Cambodian New Year is usually celebrated in 12-15 of April, it is not in August.